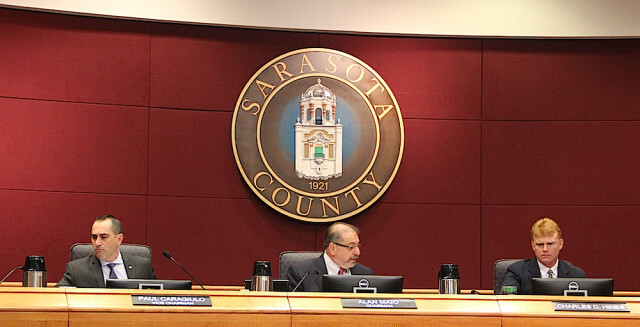 During the 2015 fiscal year, Sarasota County marked savings of about $69 million, thanks to paying off debt early and saving on interest payments, County Commission Chair Al Maio has pointed out during remarks to numerous groups and organizations in the community. With the board’s unanimous vote on March 23 to issue new utility bonds to pay off a set of older ones, the county should save another $5 million, Mike Murphy, a fiscal consultant in the county’s Office of Financial Management, reported. The bonds at the focus of the agenda item were for the expansion of the Central County Wastewater Reclamation Project and the extension of major water mains, a March 23 staff memo explains. On Jan. 13, county staff, working with PFM, issued Requests for Letters of Interest from the county’s preselected bond underwriters, the staff memo explains. All eight of them responded, Murphy told the board. On Feb. 5, Citigroup Global Markets was selected as senior manager, with Raymond James & Associates and RBC Capital Markets as co-managers, for the new borrow and the refunding measure. When Murphy noted that the total savings to the county of the transactions should be about $5 million, Commissioner Christine Robinson responded, “Louder!” eliciting laughter from her colleagues. “[The savings] will be about $5 million,” Murphy repeated the number with more volume. Over the past 18 months, Commissioner Charles Hines noted, the board has approved a number of refinancing resolutions. “I thought that we had kind of gone through everything,” he added. “I’m just glad that you’re continuing to constantly look [for more opportunities],” he told Murphy. “This is the last one we were tracking,” Murphy replied. “However, we will continue to track [others] in the future,” he said, especially as bonds come closer to maturity, and interest rates fluctuate. 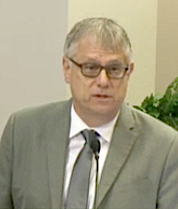 Robinson made the motion to approve the appropriate resolutions, and Commissioner Carolyn Mason seconded it. It then passed 5-0.